Sandra Carvalho is a Research Fellow at INL and her work is focused on the identification and molecular characterization of circulating tumour cells (CTCs) detected by microfluidic-based systems. 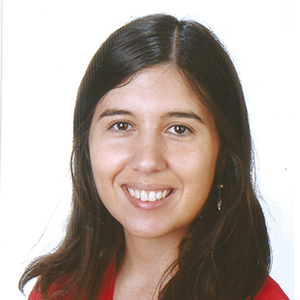 Sandra graduated in Biochemistry by the University of Minho (Portugal) and obtained her PhD degree (under supervision of Salomé Pinho, PhD) in 2015 at Abel Salazar Institute of Biomedical Sciences. The PhD thesis was developed at Institute of Molecular Pathology and Immunology of the University of Porto- IPATIMUP- and focused on to uncover the major changes in the glycan repertoire of gastric cancer cells, and more specifically on how cadherin´ glycans constitute tumour biomarkers and potential therapeutic targets. Authors: Sandra Carvalho, Celso A Reis, Salomé S Pinho. Title: Cadherins Glycans in Cancer: Sweet Players in a Bitter Process. Authors: Carvalho S, Oliveira T, Bartels MF, Miyoshi E, Pierce M, Taniguchi N, Carneiro F, Seruca R, Reis CA, Strahl S, Pinho SS. Title: O-mannosylation and N-glycosylation: two coordinated mechanisms regulating the critical functions of E-cadherin in cancer. Journal: Oncotarget. 2016 Oct 4;7(40):65231-65246. doi: 10.18632/oncotarget.11245. Authors: Carvalho S, Catarino TA, Dias AM, Kato M, Almeida A, Hessling B, Figueiredo J, Gärtner F, Sanches JM, Ruppert T, Miyoshi E,Pierce M, Carneiro F, Kolarich D, Seruca R, Yamaguchi Y, Taniguchi N, Reis CA, Pinho SS. Title: Preventing E-cadherin N-glycosylation at Asn-554 improves its critical function in gastric cancer. Journal: Oncogene. 2016 Mar 31;35(13):1619-31. doi: 10.1038/onc.2015.225. Epub 2015 Jul 20. Authors: Pinho SS, Carvalho S, Marcos-Pinto R, Magalhães A, Oliveira C, Gu J, Dinis-Ribeiro M, Carneiro F, Seruca R, Reis CA. Title: Gastric cancer: adding glycosylation to the equation. Journal: Trends Mol Med. 2013 Nov;19(11):664-76. doi: 10.1016/j.molmed.2013.07.003. Epub 2013 Aug 8. Authors: de-Freitas-Junior JC *, Carvalho S *, Dias AM, Oliveira P, Cabral J, Seruca R, Oliveira C, Morgado-Díaz JA, Reis CA, Pinho SS. Title: Insulin/IGF-I signaling pathways enhances tumor cell invasion through bisecting GlcNAc N-glycans modulation. An interplay with E-cadherin.